Instrumentation: Soprano, mezzo-soprano, alto flute/piccolo, clarinet in A/bass clarinet, percussion (1 player), piano. Commissioned by Halcyon with funds provided by Barbara Blackman. Score: Willow songs : six poems of Anne Stevenson / by Andrew Ford. 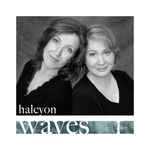 CD: Waves I / Halcyon.